Viewing small parts on a watch can be tedious on the eyes. By using a stereo microscope with low magnification, viewing the innards of a watch is simple. 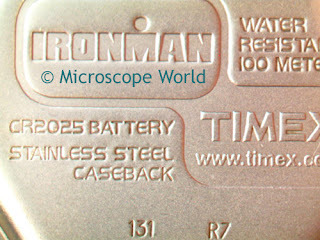 The back plate of this watch was viewed using the MW5-L5 trinocular microscope with a 0.5x auxiliary lens. The auxiliary lens was used both to increase the working distance and also to decrease magnification. Images were captured with the DMC3.1 microscope camera. Total magnification of this captured watch photo was approximately 2.5x. Back of watch captured under the stereo microscope.